Last week was the start of the #stillgood decluttering challenge and the plan was to declutter our drinks cupboards, work out what was #stillgood, what had to go and what needed using up! Did you take part? How did it go for you? I found three very out of date drinks including a carton of orange juice, a can of beer and a bottle of sparkling wine. I had been saving the sparkling wine for a special occasion and although sparkling wine doesn’t go off, it didn’t taste nice. The beer didn’t taste good either and I didn’t want to risk trying the orange juice. The juice and beer went down the sink and I’m going to have a go at making vinegar with the sparkling wine. I did try combining it with some (in date) juice, but it didn’t help sadly. I learned that champagne/ sparkling wine should be stored lying down (to keep the cork from drying out) and at a continuous cool temperature to prolong it’s life. I hadn’t done either of those things :(. 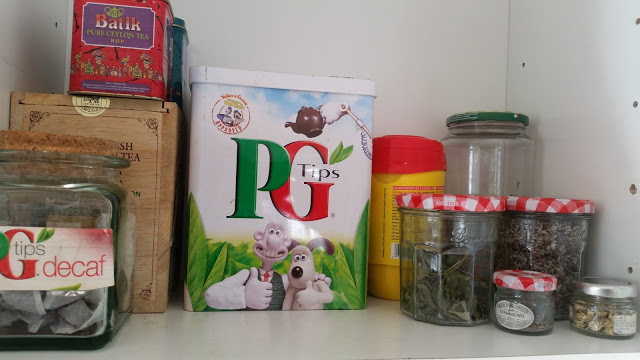 On the upside I had, had a really good clear out of our tea and coffee cupboard a while ago and didn’t find anything to declutter in there! We have had some bottles of spirits, some full and some with a tiny bit left in the bottom of the bottle, which have been untouched for years and years and I wanted them out the cupboard so that we can use it for other things. They were all fine, but they were either brought back from holidays as souvenirs and never opened or left at our house by visitors from long ago parties (in those far away days before we had kids). 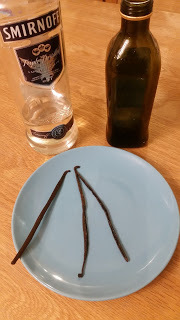 I used up some vodka and bacardi by pouring them into an old cleaned out olive oil bottle and added some vanilla pods. I’m hoping that we will have vanilla extract in a couple of months! Some of the spirits I am going to give away and some we will keep because we know they will get drunk eventually. This week the focus of the decluttering is going to be on checking the dried, tinned and canned goods (including herbs, spices and baking ingredients) in our cupboards and using up the things that need using up! It would be great if you joined in and if you want to chat about it with others online, join in with the event in the Reduce your food waste Facebook group – hope to see you there! This entry was tagged eco, food waste, Frugal, Green, reduce your food waste, thrifty, zero waste. Bookmark the permalink.